Acrylic on panel abstract painting. 6.25" x 5"7.5" x 6"8.75" x 7"10" x 8"11.25" x 9"15.25" x 12"
Original mixed media Abstract painting on watercolor paper inspired by life. 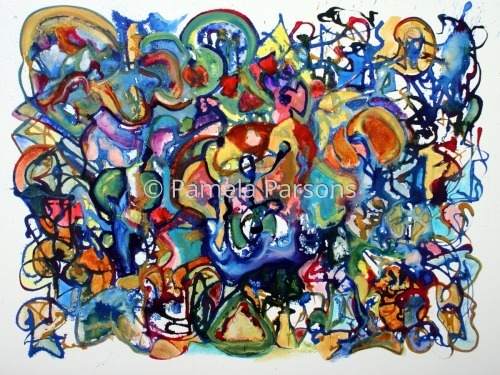 Original abstract expressionist watercolor painting. 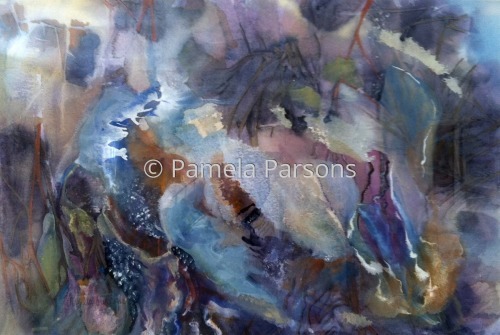 Original mixed media (watercolor, acrylic, pastel) painting on watercolor paper. This is my interpretation of what it feels like to be an introvert. 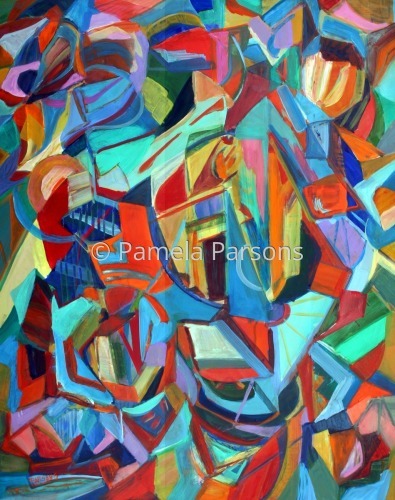 Original Acrylic on canvas abstract expressionist painting. 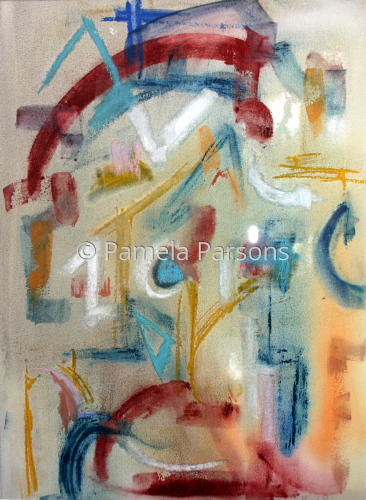 9" x 11.5"11" x 14"13" x 16.5"17" x 21.75"21" x 26.75"27.5" x 35"
Off the Edge is an abstract expressionist acrylic on cradled birch panel painting. 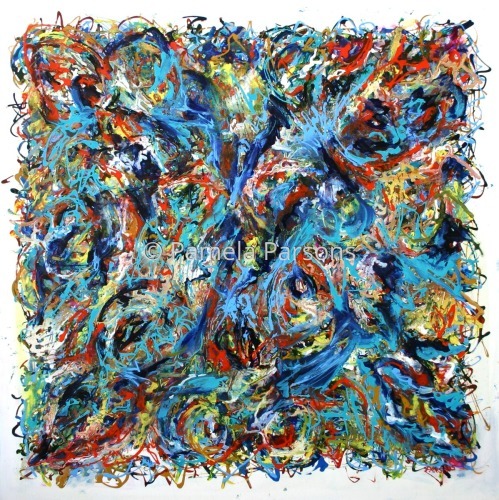 This square 2' by 2' original, signed painting can be hung unframed or framed. 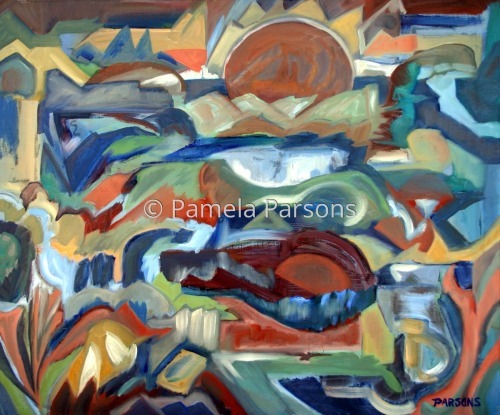 The circle of life is the theme of this abstract expressionist mixed media painting. Watercolor, Acrylic ink and paint on Arches watercolor paper. Look for these symbols in the painting: the cradle, the angel, the ocean wave, the seedling, and the white horse. This painting was accepted into and exhibited at the Pennsylvania Watercolor Society Show. Inspired by the beauty of Spring. 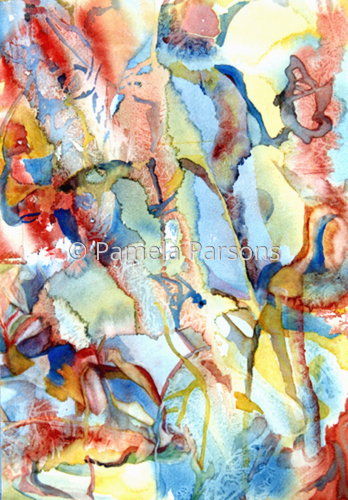 Abstract watercolor on Ampersand Aquaboard. Original, signed painting. 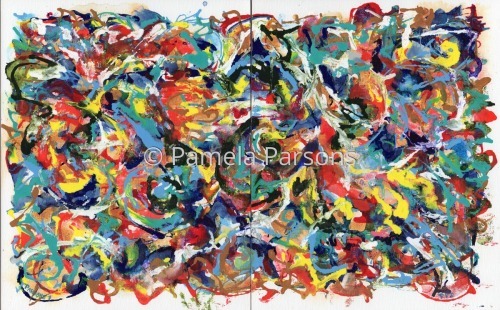 9" x 11.5"11" x 14"13" x 16.75"17" x 21.75"21" x 27"27.25" x 35"
This is an abstract expressionist acrylic on canvas painting. It is a wrapped canvas, painted on the sides so can be hung unframed. 2'x5'. 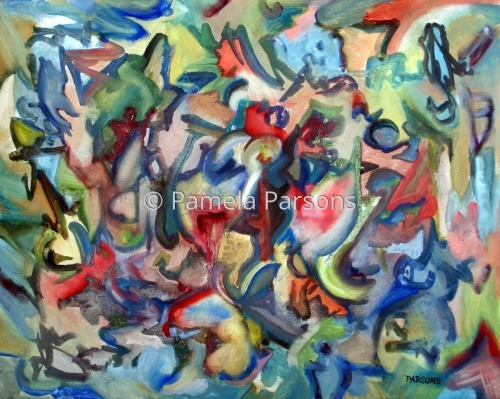 Signed original painting. 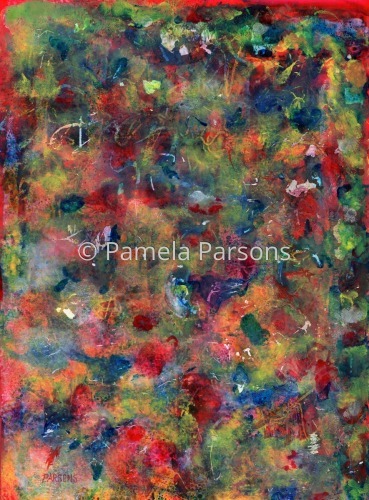 5" x 12.5"7.5" x 18.5"
This is an abstract expressionist acrylic on canvas piece inspired by our journey through life. 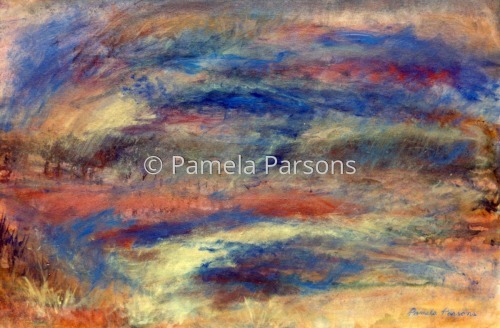 This is a wrapped canvas, painted on the sides, so can be hung unframed. 2'x5'. 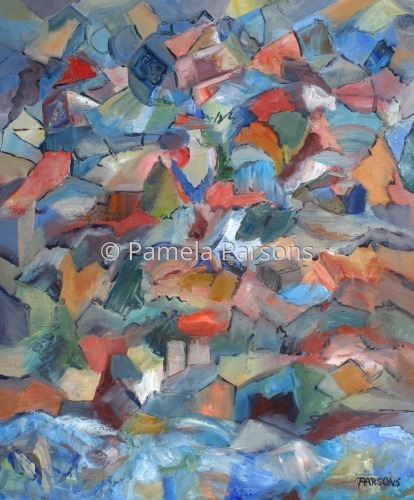 5" x 12.75"7.25" x 18.5"
Original, signed, Abstract Expressionist acrylic on cradled birch panel painting inspired by the churning power of the sea. 24x24". Could be hung framed or unframed. 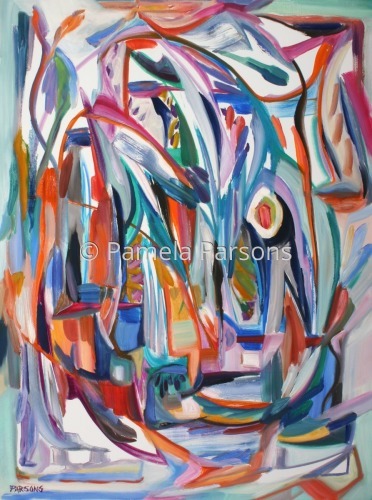 Signed original Abstract Expressionist Oil on panel painting. 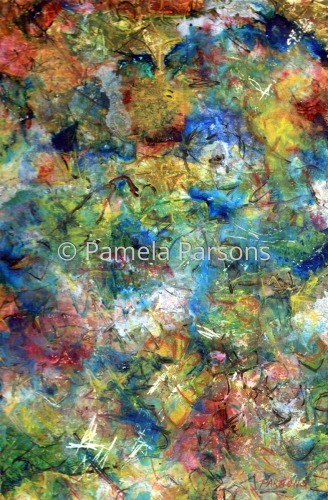 This oil on hardboard painting is an abstract expressionist work inspired by the growing of a garden. 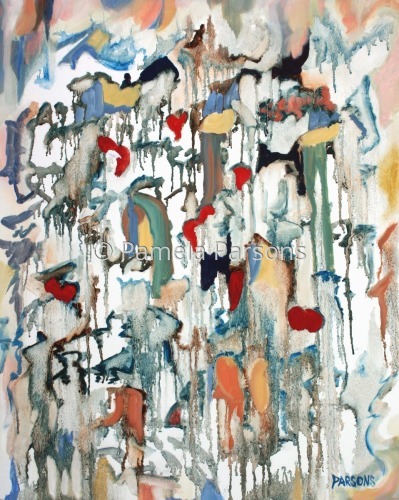 "Grow", a garden landscape of self, expresses the freedom to grow in all directions with all means of color and shape, with no boundaries or restrictions and therefore, unlimited possibilities. 5" x 6.25"6" x 7.5"7" x 8.75"8" x 10"9" x 11.25"12" x 15.25"
Abstract Expressionist acrylic on panel diptych. Each panel is 10x8". 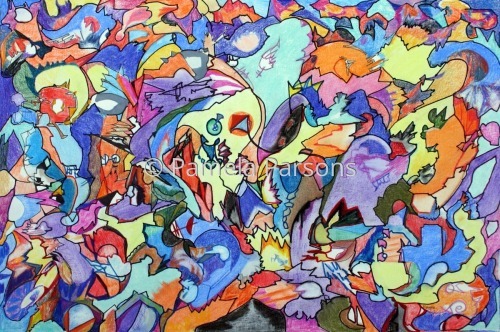 Signed, original, bright and colorful painting. 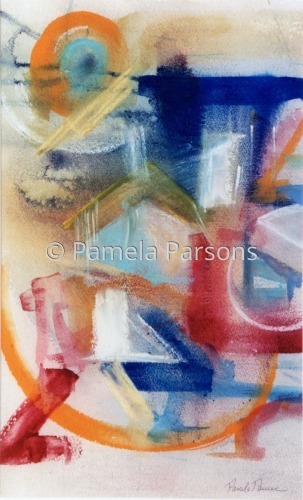 Dreamy, serene oil on panel abstract painting. This signed, original painting is currently for sale. This oil on hardboard painting expresses how I feel when I look up at the stars and think about the vastness of the universe. Broken hearts and doves flying upward express feelings of loss with hope for spiritual redemption through peace, love and the compassion of humanity living in this world. 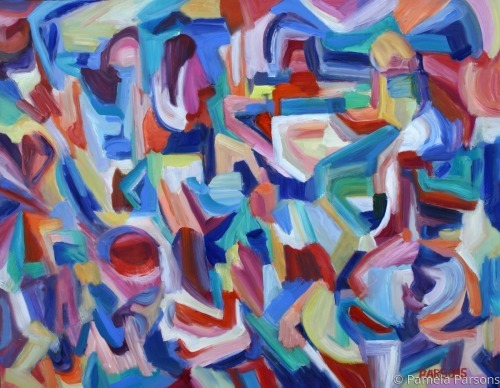 This painting was exhibited at the New Hope Arts Center Juried exhibition in New Hope, PA. 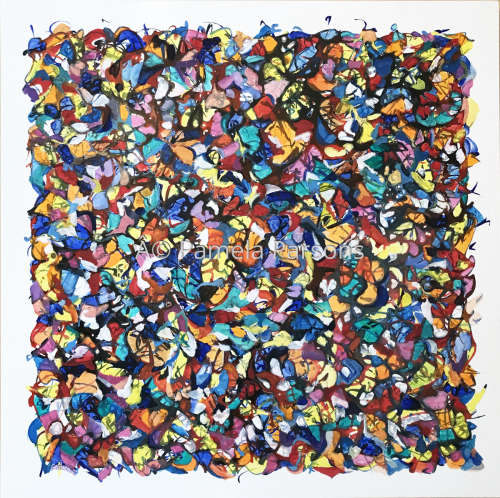 The show was juried by Ellen Bradshaw from Pleiades Gallery in Chelsea, Manhattan. It was also exhibited at the Central Bucks Chamber of Commerce Bucks Fever Juried Show. 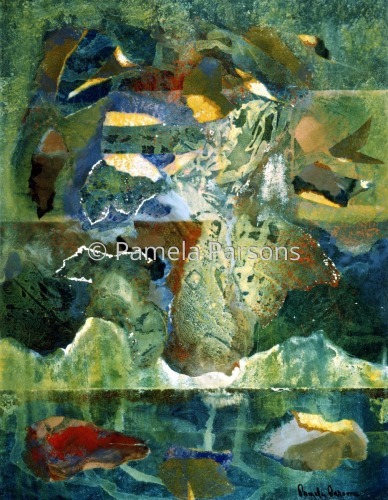 In a review by Gwen Shrift in the Bucks County Courier Times, she wrote, "I awarded points to Pamela Parsons, painter of the abstract "Moondrops," for its dripped composition and precise use of color." 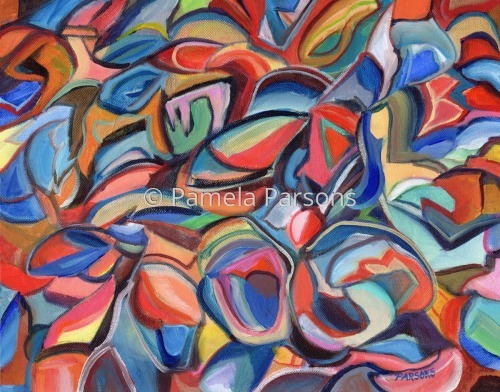 18x24" signed, original Acrylic on cradled birch panel abstract painting by Pamela Parsons. 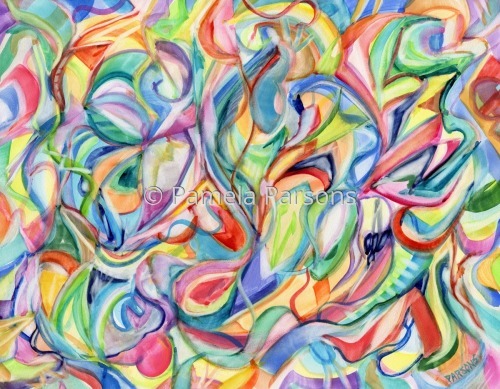 This lively, colorful abstract is inspired by the joy of experimental painting. This is a 24x18" mixed media acrylic, acrylic ink and collage on canvas painting with the theme of self discovery, the finding of the true and authentic self. It was accepted into and exhibited at the Doylestown Art League Juried show at the Bucks County Courthouse. 6.5" x 5"11.5" x 9"16.75" x 13"22" x 17"
This is an acrylic on 1/4" tempered hardboard panel abstract painting. There is the traditional still life bowl of fruit painting. 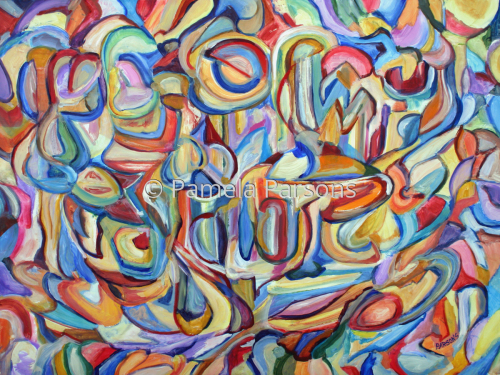 This painting was featured in the June 2015 Issue of Philadelphia Stories Literary Magazine. It was accepted into and exhibited at the Central Bucks Chamber of Commerce Bucks Fever Juried Show. 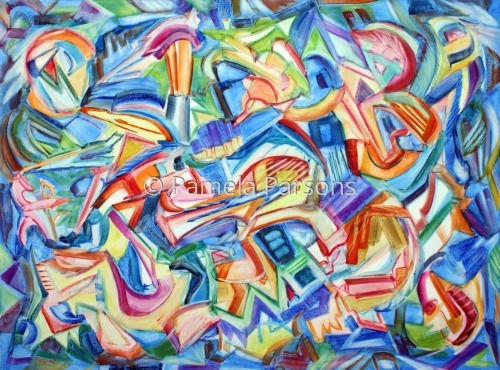 Abstract expressionist interpretation of jazz. 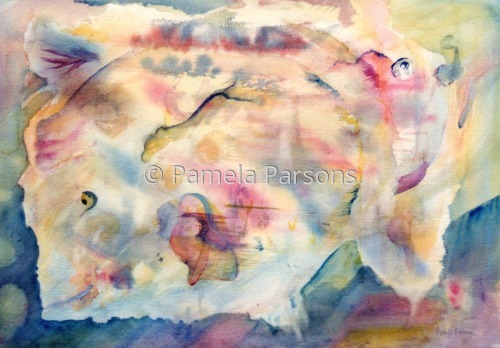 Signed, Original watercolor painting on Ampersand Aquaboard. 5" x 6.75"6" x 8"7" x 9.5"8" x 10.75"9" x 12.25"12" x 16.25"
Abstract expressionist oil on canvas painting. Inspired by the sunrise as a new beginning. 6" x 7.25"7" x 8.5"8" x 10"8" x 9.75"9" x 10.75"12" x 14.5"
6" x 9"9" x 13.75"11" x 16.75"12" x 18"13" x 19.75"15.25" x 23.25"
This is an expressionist acrylic on yupo paper painting inspired by a field of poppies. Includes acid free white mat and backing. Accepted into and exhibited at the Phillips Mill Show in New Hope in 2016. Matted with white mat to fit 16x20" frame, backing included. 6.75" x 5"12.25" x 9"17.5" x 13"23" x 17"28.5" x 21"32.75" x 24.25"
Ever lay on the grass under a tree and looked up at the sky? Looking Up through Trees is an acrylic on yupo paper expressionist painting. Original, signed painting. Includes white acid free mat and backing. Matted to size 12x16". Ready to frame. 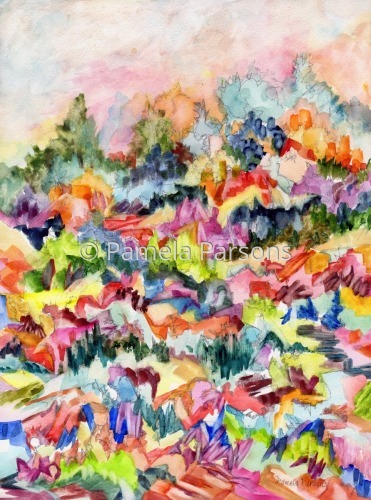 7.75" x 5"9.25" x 6"10.75" x 7"12.25" x 8"13.75" x 9"16.25" x 10.75"
Hillside is an abstract expressionist watercolor of a colorful mountain side village scene by Pamela Parsons. 12" x 9"17.5" x 13"23" x 17"24" x 18"28.25" x 21"
1/4" border around the image. 5" x 7"6" x 9"7" x 10.5"8" x 12"9" x 13.5"11.25" x 17"
Grow is an acrylic on panel abstract expressionist painting. 7" x 5"8" x 6"9.5" x 7"10.75" x 8"12" x 9"16" x 12"
This oil on panel abstract painting is inspired by the challenge of navigating through life. 5" x 6.5"6" x 7.75"7" x 9"8" x 10.25"9" x 11.5"12.25" x 16"
Abstract Expressionist palette knife oil painting inspired by the rocky cliffs along the coast of Maine. 24x20"
On gallery wrapped 1 1/3 inch thick canvas with light blue painted edges. 8.5" x 7"10" x 8"10.75" x 9"13.25" x 11"15.5" x 13"